Previous Final Fantasy movies are hit or miss so I was not having too much expectations on this. Sadly Kingsglaive is closer to Final Fantasy Spirits Within instead of Advent Children. The story is too 'realistic' and lacks of a lot of things that define Final Fantasy. In fact, if you read a synopsis without knowing the title, this movie can easily be mistaken for any other war movie of the similar genre. To proof that point, I shall summarize the story without mentioning any names. Kingsglaive basically tells a story of 2 countries at war. The smaller country (or the 'protagonist') is on the verge of losing to the invading empire (or the 'antagonist) if not for the final defensive shield which protects the whole country. The invading empire offers an unfair peace agreement and the smaller country accepts it in order to spare its citizens knowing that there is no way they can win the war. This peace agreement turns out to be the empire's ploy to destroy the defensive shield and conquer the country. Sounds familiar? 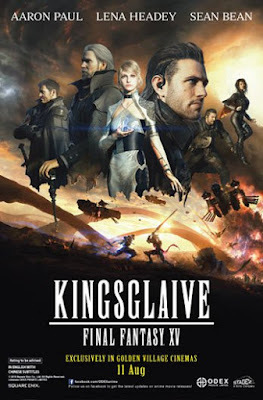 I thought Kingsglaive refers to the crystal or something but apparently it refers to King Regis' of Lucis (the smaller country) group of elite force that can use magic power of the king. As the king is growing old, he is simply losing power. However, when he agrees on the peace agreement, most members of Kingsglaive feel that the King has betrayed them, without realising the King's true reason. The main character, Nyx Ulric, stays loyal to the end to fulfill his mission: to somehow bring Lady Lunafreya to meet Noctis, who is the main character of the upcoming of FF XV game. I don't know if the movie will make more sense or will have more relevance once the game is out since the movie is meant to be a prequel. But as for now, nothing is really fantastic about the movie whether the plot, the characters, the battles, the everything. Seriously Square Enix, stop wasting money to create or write new stories for movies. Just make your FF I to X into movies and the cash will be flowing in. You already have great stories and elements form the games, just port them over to movies for goodness sake!